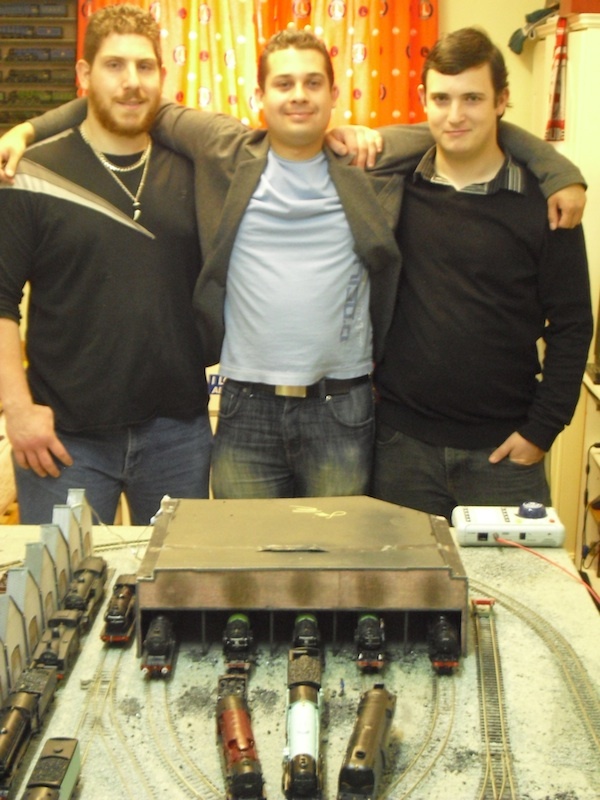 THE BRITISH RAILWAY STORIES LTD: "The PW Staff Comp 2010-11"
"The PW Staff Comp 2010-11"
From left to right: Gavin Rose, of The Railways of Sodor fame, in the middle is me (!) and on the right is Sean O'Connor of Sodor Island 3D. On the 19th July, 2011, we finally finished The Permanent Way Forum Staff Competition, which was started on January 1st, 2010...!!! Our charges (from left to right, as per their owners) were Low on Money and Starving, Fury, Late and Never Early, Dawn Treader, and Slow Rail, Bulleid Baltic Tank 22C01. Each model representing a different railway company, and a different way of doing things. Gavin's was historical, Sean's was a "might have been built" and mine was, as Sean put it, "a complete flight of fancy with some logical development of thought". Okay, that's not quite what he said, but that is my story and I am sticking to it...!!! So now I am working on a competition video, which should show us and our engines competing in a series of challenges, Top Gear style, to see which would come out on top. After all - how hard could it be? "PW Staff Competition - Results Video (Trailer)"
"Hornby VS Bachmann Tornado Review"